Uber often defends its "surge" price increases by explaining capitalism, but it took a new tack after a controversial surge in London. The city was gripped by a tube strike yesterday that brought train service to a standstill, forcing commuters to find other ways to get to work. The sudden demand for buses, taxis and ridesharing services kicked Uber's app into surge mode, causing fares to triple at one point. That produced a lot of righteous anger in social media and the press, prompting the company to release an article "reviewing" its own app against others to show that surges are a good thing. Uber compared its own wait times to Gett, Hailo and Adison Lee, and (wait for it) came out on top. Addressing the controversial fares, it said that the higher rates benefit everybody since more drivers are motivated to hit the road. And during the strike, it said that double the number of UberX drivers were available. It added that the surge fares weren't actually that bad, since Uber pricing is often lower than taxis and other services to begin with. 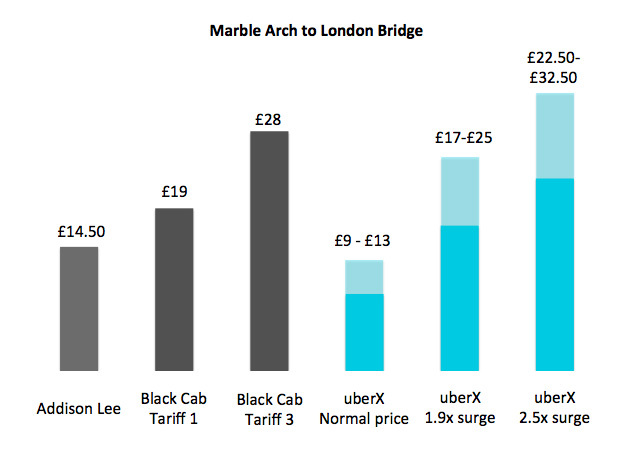 Nevertheless, its own chart also showed that a £19 cab far could've run as high as £32.50 when surge pricing hit 2.5X in the AM (it went as high as 2.9X). Uber said that it provides users with a clear warning about surge pricing, and offers the option of waiting for it to go down. It also reminded everyone that "no one has to travel when surge pricing is in effect – it's entirely your choice." Still, other see it differently. A London mayoral candidate told the Guardian, "Uber may be very clever with their 'dynamic demand,' but it still looks like a rip-off when you are struggling to get to and from work while the tube is out of action."